Whenever customers ask me about the best tankless water heaters on the market, I nearly always direct them to whole-house natural gas models. They're the ones that most closely resemble a traditional HVAC system, so if you're looking for a comfortable, convenient water heating set-up, natural gas units are the way to go. But which ones are the best ones? Which brand is the kind I would install in my own home? Which model offers the most features for the money? Ladies and gentlemen, allow me to introduce the Rinnai RU98IN 9.8 GPM Indoor Ultra-NOx Condensing Tankless Natural Gas Water Heater. First things first: let's talk about the numbers you'll enjoy with the RU98IN. The flow rate can reach up to 9.8 gallons per minute (GPM). This is a phenomenal number, one of the best out there, though it should be noted that it only applies to homes in mild-to-moderate climates. If you live somewhere arctic, your flow rate might range anywhere from 5-6 GPM. In terms of size, the RU98IN measures 18.5 x 10.1 x 26.4 inches and weighs 70 lbs. This is a hefty unit that will require some room to install, but it's still less bulky than a traditional water tank, so you're coming out on top in terms of floor space. The RU98IN can require up to 199,00 BTUs, but it also has an energy factor of 0.94, so keep both numbers in mind when calculating energy efficiency and what you'll pay on your bill. 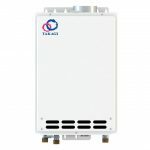 Remember, too, that all tankless water heaters are better than water tanks in terms of saving money. As a whole-house unit, you can expect the same performance from the RU98IN that you would from a regular water heating system. It'll serve multiple bathrooms at once without problem. Whether you're washing dishes, filling a tub or doing a load of laundry, the RU98IN will deliver. One thing to note about this unit is that it comes with a special NOx system. 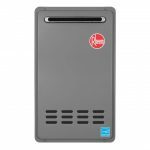 Unlike some natural gas tankless water heaters, it doesn't have to be installed outdoors, and you don't have to worry about dangerous fumes building up in enclosed spaces. This is because of the RU98IN's internal compressing system. You will need to install it with a series of vents, however, because no natural gas model can go without them. But we'll talk more of vents in the installation section below. As previously mentioned, you'll enjoy up to 9.8 GPM with the RU98IN. This number might fluctuate depending on the temperature outside. The colder it is, the harder your unit will have to work to deliver the same water temperature and pressure. If put in a residential home, your temperatures can range from 98°F - 140°F. If installed somewhere commercial like an office building, your temperatures can range from 98°F - 185°F. All temperatures can be adjusted with a special Rinnai remote control. All right, let's talk about that NOx. The good news is that Rinnai has made installation as simple as possible, so in addition to a detailed instruction manual, you'll also receive special isolater valves free of charge. The bad news is that you might need to order a few other parts too. If you have any uncertainties about installing the product yourself, I recommend that you let a trained Rinnai technician do it. Not only is it easier, but you also won't run the risk of voiding your warranty through a messy DIY installation. 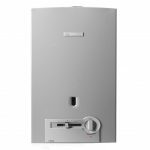 As with any tankless water heater, there are pros and cons to choosing the RU98IN. Let's take a closer look at both sides of the equation. All in all, if I had to rate the Rinnai RU98iN, I'd give it five out of five stars. While it isn't a flawless system, its drawbacks are almost negligible when compared to its benefits, and it's a system that I've recommended to many homeowners over the years. You don't have to take my word for it, however: Check it out on Amazon and read its reviews for yourself!